According to information recorded on the back of the image, ‘On the set of ‘Ferry cross the Mersey’’ depicts four female film set extras, one of whom has just had her arm autographed by a star from the film. Director Jeremy Summer’s 1965 film (UK release), which was shot on location in Liverpool focused on the Merseybeat scene that flourished there in the early sixties. The film starred Gerry and the Pacemakers band members and featured scenes in local nightclubs such as the Cavern, where it is thought the Morley image may have been taken. 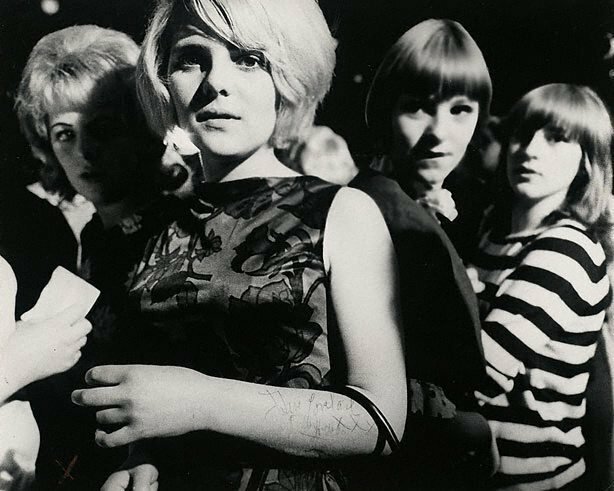 Morley has effortlessly captured the expression of ebbing awe on the young woman’s face after her brush with fame, the curious and perhaps envious expressions of those nearby, and most beautifully the stylish Mod fashions of the day. This is one image from a photo story based around Brian Epstein in Liverpool which was included in Morley’s 2006 exhibition at AGNSW and used as the catalogue cover and exhibition invitation image.